The province’s police watch dog agency has been called in to investigate after a man suffered serious injuries after falling 45 metres into the Niagara gorge, early Thursday. According to Ontario’s Special Investigation’s Unit, Niagara Regional Police responded to a call at the Hampton Inn on River Rd. at 6:40 a.m. New Year’s Day. “Officers were dealing with a number of people at the inn in relation to the call,” SIU spokesperson Jasbir Brar said Friday. The man had fallen 45 metres into the gorge near the Niagara Parks Commission’s White Water Walk. 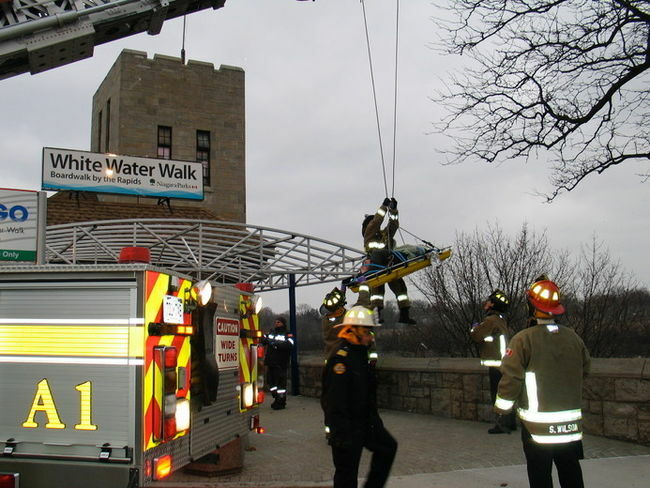 The Niagara Falls Fire Department, Niagara Parks Police and Niagara EMS were involved in the rescue. “All services worked seamlessly together during this incident,” said deputy fire chief Jim Boutilier. Once the injured man was located, It took emergency personnel about an hour to retrieve him. “This area of the gorge is very challenging due to vegetation and steep terrain,” said fire chief Lee Smith. The man, whose name has not been released, was airlifted by an Ornge helicopter to Hamilton General Hospital with serious but non-life threatening injuries. While there is an elevator at the White Water Walk attraction that leads to a boardwalk at the bottom of the gorge, it was not in operation.